This hot dog is from a hamburger spot in Urbana, Ohio -- Crabill's. 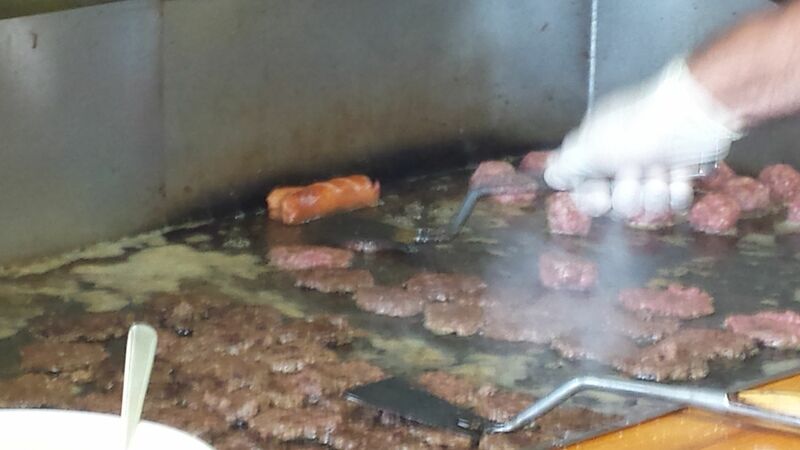 They cook them on the flattop in about a quarter inch of oil along with the burger patties. They are really, really delicious, with a good snap when you bite into them. That's a nice looking minimalist doggie. Didn't know Crabill's served Hot Dogs. Also, I thought they served a steamed burger. I must be confusing them with someplace else. Are the hot dogs a fairly recent addition to the menu? I can't remember if they were available when I visited in 2015, but I also can't imagine I wouldn't have tried one if they were. Steamed burgers are a Connecticut thing. Well, they're a thing at just a couple of places there. Everywhere else in Connecticut they cook them like normal people. I think they had them in 2015, but I'm not sure. They're more recent than catsup, though. They started making that red stuff available in 1990. They did have them in September of 2015. That's when I was there with my wife and she was the only one in the place who ordered a hot dog. At one point, the grill-man must have used his spatula to shovel grease from the grill right onto the hot dog about a dozen times in a row. I think I had a bite and lived to tell about it. Here is a shot of the grill with her hot dog next to the burgers that I'm sure I included with my trip report at the time. Those sure are small burgers..do you get doubles or triples?...Hot dog,too is small, but it looks like a natural casing. Is it? In my case, I think I had a couple of doubles. We were going straight from there to Henry's for pie. Michael will have to answer on the natural casings. I don't recall from the one bite I took. lleechef and I get doubles. She usually gets two with mustard, relish, chopped onions and cheese. I get three or four without the cheese. The hot dogs are skinless, but with the almost deep frying you get the snap of a natural casing. At least, the one I had yesterday snapped. They did have them in September of 2015. And I was there just a few weeks earlier, so apparently I dropped the ball and missed out! If my life stays on schedule I'll most likely stop there in 2019, although I'll probably have time to detour up that way this August.